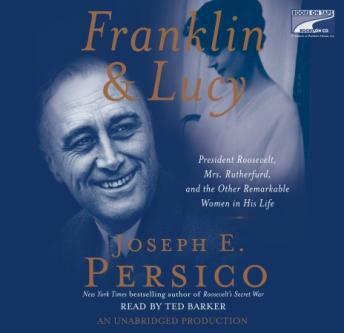 In Franklin and Lucy, acclaimed author and historian Joseph E. Persico explores FDR’s romance with Lucy Rutherfurd. Persico’s provocative conclusions about their relationship are informed by a revealing range of sources, including never-before-published letters and documents from Lucy Rutherfurd’s estate that attest to the intensity of the affair, which lasted much longer than was previously acknowledged.FDR’s connection with Lucy also creates an opportunity for Persico to take a more penetrating look at the other women in FDR’s life. We come to see more clearly how FDR’s infidelity contributed to Eleanor Roosevelt’s eventual transformation from a repressed Victorian to perhaps the greatest American woman of her century; how FDR’s strong-willed mother helped to strengthen his resolve in overcoming personal and public adversity; and how both paramours and platonic friends completed the world that FDR inhabited. In focusing on Lucy Rutherfurd and the other women who mattered to Roosevelt, Persico renders the most intimate portrait yet of an enigmatic giant of American history. I must admit I felt a bit unfaithful to Eleanor in reading about Lucy and Franklin. I am a great fan of Eleanor and read all I can about her. This book covered a great deal about Eleanor as well as ALL the other women in Franklin's life. I was surprised at how many women Franklin had around him. I recommend this book to any one interested in WWII or fans of the Roosevelt's.